Thanks to funding from Organization of the Petroleum Exporting Countries’ (OPEC) Fund for International Development (OFID), the Grenada Boys Secondary School has received a major upgrade to its current institutional facilities, which will transform student services and students’ ability to access high-quality, modern skill training facilities. 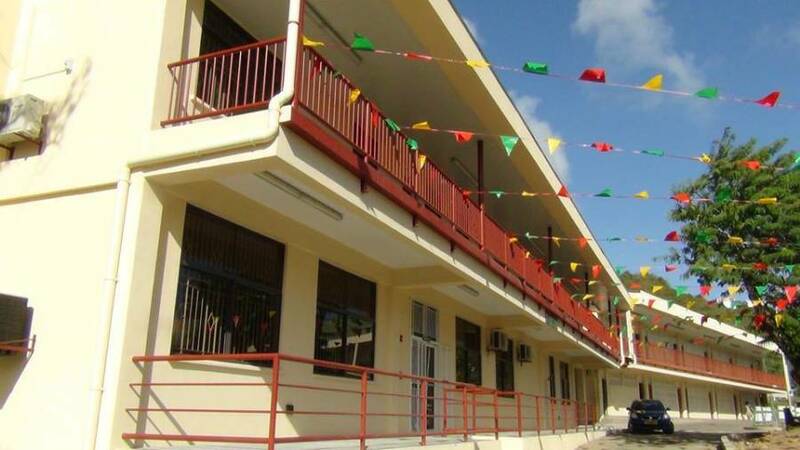 The upgrade includes a new administration building for staff, which is already in use, and a technical block, at the back of the school, which meets the standards for certified training, associated with the Caribbean and National Vocational Certification programmes, administered by the Grenada National Training Agency (GNTA). Project Engineer [VIKAB Engineering Consultants Limited] Dave Deokaran, said, “I am very satisfied with the execution of this particular project. The contractor has done a remarkable job and the workers have done an excellent job as well.” Deokaran said they had few challenges in completing their work, even if the job entailed working around an already existing school structure. He commended students for their high level of cooperation. “The administration building comprises of offices for the principal, vice-principal, receptionist, staff room, conference room, guidance and counseling room and lunchroom and toilet facilities. The technical laboratory comprises of laboratories for Woodwork, Technical Drawing, Food and Nutrition, Home Management and Clothing and Textiles,” Deokaran said. He also mentioned that the scope of works includes an access road and a car park, for the technical building, and also ensures proper drainage. The 12-month project was executed at just under EC $9.2 million and is part of the Ministry of Education and Human Resource Development’s portfolio of projects. Principal of the Grenada Boys Secondary School, Mr Phillip Thomas, is very pleased and thankful for the new facilities provided, and sees many benefits to be obtained. With regard to the new technical block, he said that prior to this addition, students were restricted to being taught only a few technical and vocational subjects, such as Electricity and Electronic Technology, Technical Drawing and Building Technology. He is happy that the young men of GBSS will get the opportunity to learn other skills. The upgrade also provides improved facilities for students currently doing Woodwork, who would no longer have to do activities on the pavement behind the school, but in a room built to accommodate them. Phillip sees having the new facility and tools, as a major motivator for young men to do their best, in the skill-related subject areas. “The world is moving in that direction of technical education — students having that kind of background, so that they can fit in — because a lot of jobs now are technical jobs, and it’s good to know that with the quantity of students we have here, we are able to at least equip boys with those skills,” Thomas said. Speaking on the impact of having a new administrative building, Thomas said, “whatever we do, as teachers — as an institution — it must eventually impact on the students — improve student outcomes.” He expects that the new administrative building will improve current services offered and productivity. “Now we have a significant portion of our staff in one room, so it makes for better planning, is better for camaraderie and the general interpersonal relationships among staff,” he noted. This project is in keeping with the Government’s commitment to facilitate effective delivery of the school’s curriculum and a similar project is currently underway at the Mac Donald College, due to be completed within the first half of 2015. The GBSS project began in April 2014 and is now complete, with cleanup activities currently in progress. The new facilities are expected to serve as part of the nation’s National Hurricane Shelters.